We’ve found that the best way to help our dentists is to anticipate their questions and concerns before they have them. One common technical process that tends to frustrate many dental professionals relates to seating a crown. Etching, contacts, oven temperatures, and more tasks can be tricky, so we asked Gold Dust lab ceramist Joost Jorna to clear up the fundamental info dentists need to get the most out of their time and effort. GD: How can a dentist tell if the crown was etched? Joost: If you look at the inside of the crown you can see a white, rough surface. See picture. This is when the inside is etched. GD: Can the dentist add contacts if they have their own oven? GD: How do they know what temperature to use? Joost: The temperature with “e.max add-on ceramic” is 700 Celsius (1292 F). Hold it for 1 minute. You don’t need to etch it again after it has been in the oven. GD: The dentist needs to adjust an e.max crown, what’s the best way to do that? 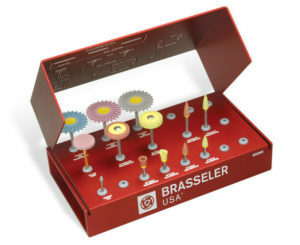 Joost: The best way to adjust e.max is to use the Brasseler chair side adjustment kit. It is specially developed for polishing e.max. It comes with intra oral and extra oral options. See picture. GD: If the dentist adjusts the crown, is polishing okay or does it need to be re-glazed? Joost: Polishing is perfect. Glazing the crown is only necessary if you cannot reach the surface by polishing with the kit. You can read more insight into lab work and thoughts from our ceramists here and here. And don’t miss Dr. Brady’s recent blog series on the popular topic of sleep dentistry. 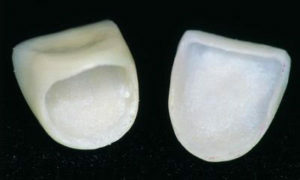 What questions or concerns do you have about seating crowns? We’d love to hear from you in the comments!